You don't see many of these around anymore. 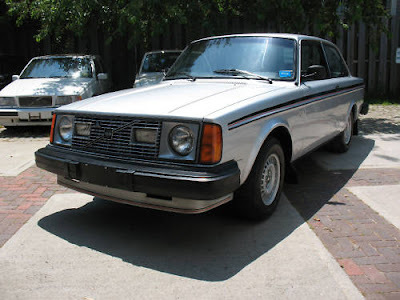 The Volvo 240-series cars were well engineered, extremely durable, incredibly practical cars. Sporty, they were not. The 242GT was Volvo's attempt at changing that. The 242GT was still well engineered, extremely durable and incredibly practical, but it had a bit of sportiness about it, too. Volvo basically took the stock 242 (200 series, 4 cylinder, 2 door), dressed it up and called it the GT. 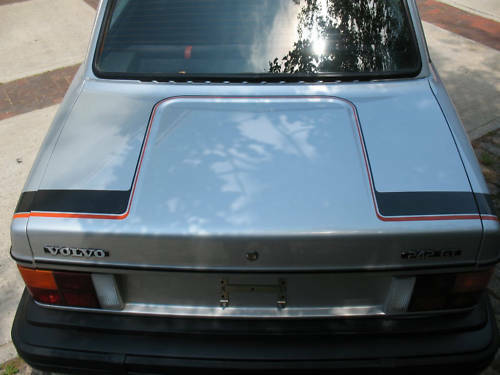 All 242GTs were painted silver and had orange and black stripes. The front end got a little spoiler. The grill had a pair of well integrated driving lights. The wheels were a 14 x 5 1/2-inch alloys. 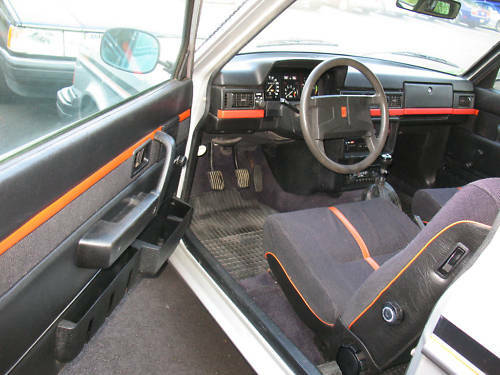 Inside, All 242GTs came with black corduroy seats with an orange vinyl stripe. It also had an orange stripe running the length of the dashboard. That doesn't sound real good on paper, but it actually looks really cool, in a retro kind of way. The GT also got a tach, a smaller diameter steering wheel and a shorter shifter. To give it a little crisper handling, Volvo tweaked the suspension, replacing the standard 17mm front sway bar with a 23mm bar. The springs were stiffened and the shocks were revalved. I remember seeing a few of these cars back in the day, but I haven't seen one for a very long time. I doubt that many still exist. This car has 126,553 miles on it. That's low mileage for an old Volvo. The seller says that most of the car is original. The Buy It Now price of $9,850.00 is steep, but if you're looking for a unique old Volvo, one that is loaded with all the things that made Volvos great 30 years ago along with a few sporty touches, this car may be for you. Just don't expect to win many races. Located in Portland, Maine, click here to see the eBay listing. To be fair, the 100hp was slightly more power than the BMW E21 318 that it competed with. Though I concede that the BMW was lighter. I own a '79 GT and I love it, it has aprox 80,000 miles. I just wish I had more time and money to put into the restoration right now. I had a '78 242GT which I bought new. Great car, very rugged and "sporty" in the Volvo sense. $7800, which was pretty steep back then. The car was well made and stood up to years of abuse. 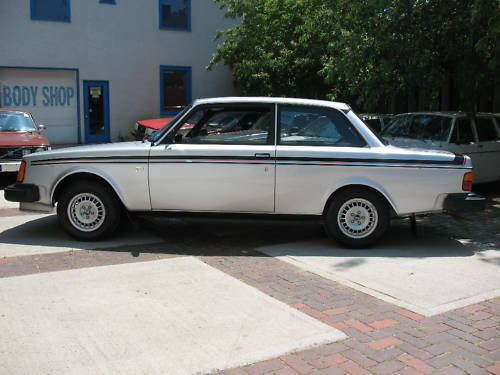 I have a 1979 242 GT Volvo. I bought it used in San Jose CA in 2001 just after 9/11. The kid who had it didn't think it was cool. It had 195,000 on it and the OD worked. I needed another car quick cause I had been in chain reaction accident in my 82 244 so I bought it. The car is still running pretty well and it has 311,000 on it. I am about to replace the exhaust system on it and do some more work so that it will pass Mass. inspection. I like the way it handles and the mileage is still reasonable at 25 to 29 mpg. I owned a new 79 242GT fortwo months and was sooooo excited. It was great and I was re-ended at 60 mph. It saved my life..My insurance paid for a 1980 new one . I had it for 4 years and wish i never sold it. Very solid and I never thought of it as a slow car. The 4 speed made it feel very capable and tight. My first car in High School was a 78' 242 GT, which i racked up almost 500K miles on it and loved every mile. That was 20 plus years ago and last year I just bought a pristine original condition 79'GT, I'll probably be laid to rest in this one. My first car was a '79 242 GT. My parents handed it down to me for my 16th birthday. It was a great car! My mom and I were reminiscing about it today. It was the first Volvo in our family and it started a serious trend (23 years ago)! Great pics, brought back lots of memories! I loved the OD switch and the hand crank sunroof. I'd LOVE to have her back to pass on to my daughter! I have an Aussie 242 GT 1979 model. Great car can't kill it, so I decided to put in a B230FT. Now I will have it forever.